Christendom College is a Catholic coeducational college institutionally committed to the Magisterium of the Roman Catholic Church. The College provides a Catholic liberal arts education, including an integrated core curriculum grounded in natural and revealed truth, the purpose of which at both the undergraduate and graduate levels is to form the whole person for a life spent in the pursuit of truth and wisdom. Intrinsic to such an education is the formation of moral character and the fostering of the spiritual life. This education prepares students for their role as faithful, informed, and articulate members of Christ’s Church and society. The particular mission of Christendom College, both at the undergraduate and graduate levels, is “to restore all things in Christ,” by forming men and women to contribute to the Christian renovation of the temporal order. This mission gives Christendom College its name. The only rightful purpose of education is to learn the truth and to live by it. The purpose of Catholic education is therefore to learn and to live by the truth revealed by Our Lord and Savior Jesus Christ, “the Way, the Truth and the Life,” as preserved in the deposit of faith and authentically interpreted in the Magisterium of the Roman Catholic Church, founded by Christ, of which the Pope is the visible head. That central body of divine truth illumines all other truth and shows us its essential unity in every area of thought and life. Only an education which integrates the truths of the Catholic Faith throughout the curriculum is a fully Catholic education. On the foundation of this principle of immutable fidelity to the truth of the Catholic Faith, Christendom College was founded in 1977 by lay Catholic educators. Christendom College seeks to form its students using a challenging curriculum centered on faith and reason, on the truths of Divine Revelation as taught by the Roman Catholic Church and the truths of natural reason as derived from natural law and human experience in fidelity to the Magisterium. The curriculum undertakes to integrate harmoniously the knowledge acquired from these sources. The College desires to foster in its students a commitment to the lay apostolate, that is, the task of transforming the social order in Christ. The faculty and administration present the following document as a statement of that vision of Catholic undergraduate liberal education which the Founders undertook to restore and promote by the establishment of Christendom College. 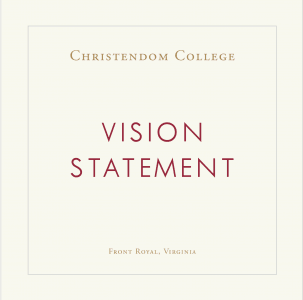 The Christendom College Vision Statement was prepared at the direction of Dr. Timothy T. O’Donnell, KCHS, President (1992-Present), by Dr. Robert C. Rice, Vice President for Academic Affairs (1983 – 2002), with the valuable assistance and support of Founding President Dr. Warren H. Carroll and the Faculty Senate. Unanimously approved by the Board of Directors January 24, 1998.